This page covers 5G Cell phone basics including its providers or companies. It mentions list of 5G cell phone providers or 5G cell phone companies with manufacturers and their respective features/specifications. What is 5G Cell phone? Like GSM cell phone which connects with GSM network for its operation to transmit/receive voice or data or sms, 5G cell phone connects with 5G NR mobile network for the same. Most of the 5G phones have been developed as per 3GPP 5G NR specifications unlike 5G TF compliant phones developed as per Verizon 5G TF specifications. 5G cell phone operates on 5G radio frequencies finalized for different parts of the world. It uses three frequency bands below 1 GHz, from 1 to 6 GHz and above 6 GHz radio frequency bands. 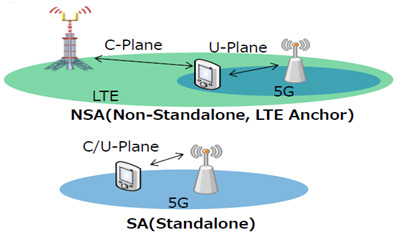 5G phones works either in non-standalone mode or standalone mode. In non-standalone mode it relies on existing 4G networks for connection establishement and uses 5G for data. In standalone mode it uses 5G for both connection establishment and data flows. 5G cell phone supports many unique features which normal cellular phones do not support. These features include fast download and upload speeds (about 10 times than 4G phones), lower connection time with network, and so on. Moreover it uses mmwave frequencies (abobe 6GHz) and hence offload traffic from existing cellular spectrum which uses radio frequencies below 6GHz. Massive MIMO and Beamforming techniques are employed in 5G base stations. This helps in increasing the capacity of the cellular betworks to support large number of 5G phones without any interference. The 5G wireless network uses many low power small cells instead of one high power cellular tower. This provides continuous 5G network connections to blocked 5G users due to trees or buildings and avoids high EM radiation effects to human beings. The major telecom carriers and device manufacturers are working towards providing 5G networks and 5G cell phones to fulfill this reality. Intel and Qualcomm are leading manufacturers of the 5G chips which will be used in 5G Cell phones. The 5G compliant cell phones are available in late 2018 or early 2019. Following is the list of 5G new cell phones which are going to be available soon and many more are under development. Samsung has recently announced that galaxy S10 or Note-10 will support 5G features. The company NOKIA has demonstrated 5G technology based prototypes showing peak data rate speed of over 30 Gbps. The technology will serve more than 1 million 5G phones in single cell simultaneously. • It uses Snapdragon 835 Octa Core Processor. • It uses snapdragon 835 processor. • It supports 4GB RAM.